Captain Jeff Kuss passed away on June 2, 2016 due to a fatal aviation accident. 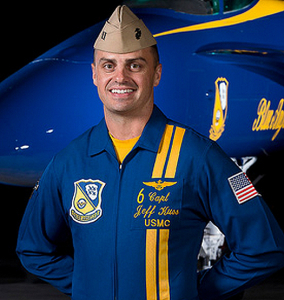 Captain Jeff Kuss served as the "opposing solo pilot" for the Blue Angels, flying in the number 6 position. He joined the team in September 2014. Kuss is said to have maneuvered his jet away from populated areas when he crashed, possibly saving lives before he was killed. Some power outages were caused by the crash, but no civilians were hurt. Please refer all contribution questions to bapao@navy.mil or visit U.S. Blue Angels website for more information.